She restored her agency's fiscal health as DHHS commissioner for Gov. LePage, but critics say she also tore a hole in the social services safety net. 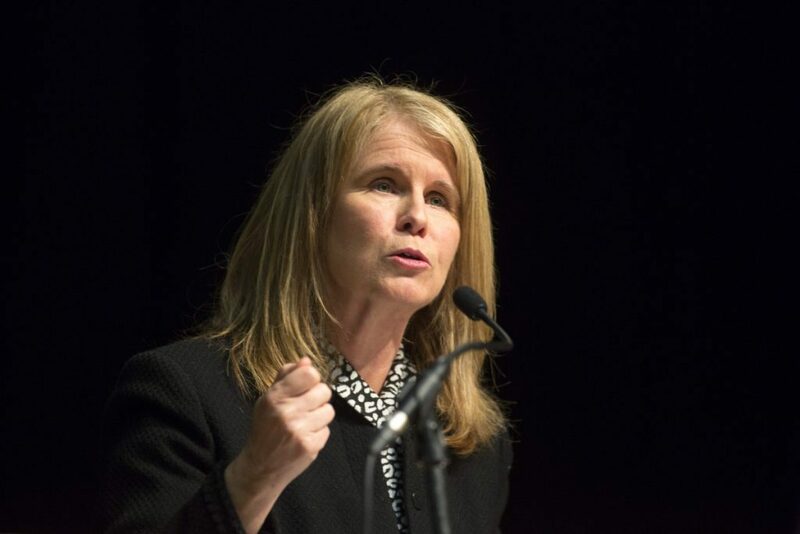 Former Maine health commissioner and Republican gubernatorial candidate Mary Mayhew has been tapped by the Trump administration to lead Medicaid, the health insurance program that covers more than 70 million low-income Americans. Seema Verma, head of the U.S. Centers for Medicare and Medicaid Services, said in a prepared statement Monday that Mayhew has been named deputy administrator of the centers, and director of Medicaid. She also will oversee the Children’s Health Insurance Program, or CHIP, which is offered to some families that have children and make too much money to qualify for Medicaid. The two programs cost more than $350 billion annually, or about 10 percent of the entire federal budget. Maine voters did eventually vote by referendum to expand Medicaid, but that expansion has been mired in legal challenges by LePage and still hasn’t been funded. LePage lauded Mayhew when she departed his administration in May 2017, crediting her with restoring fiscal health to a state department that routinely operated above its budget before his tenure. “She spearheaded the many important welfare reforms developed under my administration, and she was the lightning rod for constant criticism from the media, liberal legislators and the special interests who wanted to protect and grow Maine’s entitlement programs,” the governor said at the time. However, Rep. Drew Gattine of Westbrook, the former Democratic chair of the Legislature’s Health and Human Services Committee, believes Mayhew left a legacy of aggressive and short-sighted cuts to social services that Maine likely will need to rebuild for years to come. “What we’ve seen over the last eight years is a gutting of a lot of services that has resulted in a lack of attention and focus on core things like protecting children, seniors and adults with developmental disabilities,” he said. Gattine often clashed with Mayhew on policy and he isn’t surprised that the Trump administration hired her. “I think she is someone who was antagonistic toward Medicaid, so she fits into a long line of Trump appointees who are antagonistic about the programs they are asked to oversee,” he said. Mayhew’s tenure at DHHS saw prolonged problems at Riverview Psychiatric Center, which lost its federal certification in 2013 over deficiencies in patient care and still hasn’t gotten it back. She was criticized by some health advocates for a slow and weak response to the state’s opioid crisis, which claimed more than 1,000 lives from overdoses from 2015 to 2017. Mayhew did not respond to a message seeking comment Monday. Having led DHHS since LePage took office in 2011, Mayhew stepped down in 2017 and announced she was running to succeed her boss. Her campaign never gained traction, though, and she finished third in a four-way primary in June. She received 14 percent of the vote, well behind the eventual nominee Shawn Moody and also trailing Republican state Senate leader Garrett Mason. The governor’s spokesperson said Monday that LePage was traveling and likely wouldn’t be able to comment on Mayhew’s appointment until Tuesday. Mayhew, who grew up in Pittsfield, had been a longtime Democrat and hospital lobbyist before she joined the LePage administration and took over the state’s biggest department. Almost immediately, she began streamlining DHHS at LePage’s direction. Mayhew succeeds Brian Neale, who had been the director of Medicaid and CHIP until he stepped down in January. Tim Hill has been serving as acting director since then. The salary range for Mayhew’s position is between $126,148 and $189,600.